Uprising, Conflict Offer A Lesson In Dignity In her weekly commentary, host Michel Martin kicks off the program's February series focused on Black History Month. She notes the similarities between uprisings in the Middle East and the so-called "Great Migration" of 5 million Southern blacks in the U.S. fleeing to other parts of the nation. 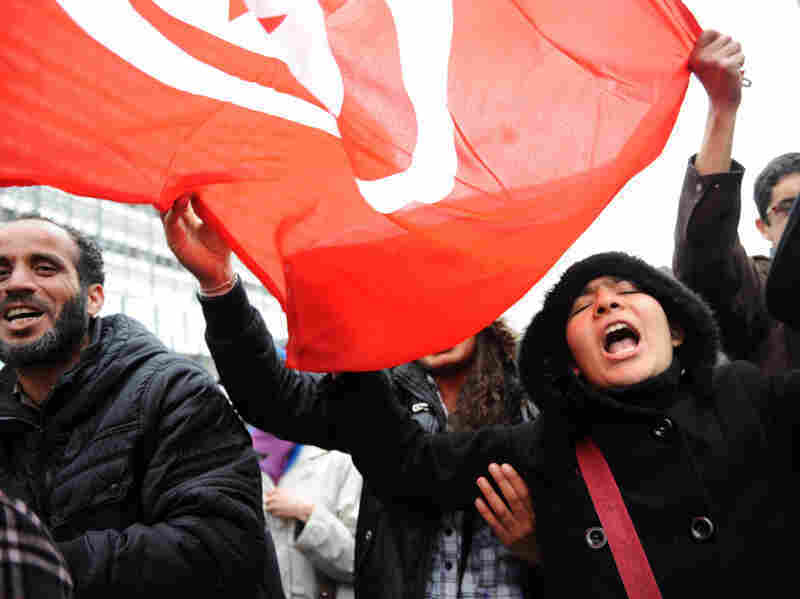 Tunisian students shout during a demonstration in solidarity with Egyptian protesters on Monday in Tunis. A popular revolt in Tunisia forced President Zine El Abidine Ben Ali to flee the country. And mass demonstrations in Egypt continued for the seventh day today, demanding the ouster of President Hosni Mubarak. I have been, like most people, following news of the street protests and unrest in the Middle East. And it may seem strange, but my mind keeps going back to a book I read last summer by the great former New York Times reporter Isabel Wilkerson. It is called The Warmth of Other Suns and it is about the so-called Great Migration. It details the mass movement of millions of blacks from the rural Southern United States to the North, Midwest and West in the decades following the first World War, up until the beginning of the 1960s. What would one have to do with the other? Well can I just tell you? Both can be summed up in one powerful word: dignity. Dignity means many things — not least, the ability to earn a decent living. In Tunisia, the street protests started after a man set himself on fire when a police woman went well beyond issuing him a fine for his unlicensed vegetable cart. She slapped him and took his dignity. For him, it was the last straw. Dignity also means the right to have both privacy and meaningful participation in the life of one's country, without the iron grip of those who place themselves in charge. This is true whether it's a state security apparatus or the Ku Klux Klan. Isabel Wilkerson's tremendous reporting took us into the lives of three very different people — a doctor, a sharecropper's wife and an orange picker — who each left everything they knew for an uncertain future. One man left because he knew his life was in danger for asking for five cents more per pound on the oranges he picked in the hot sun. Another left because — even though he wore the uniform of his country, and was trained in medicine — he knew he would never be allowed to fulfill his professional destiny in the town in which he grew up. So it is with those whose protest we see playing out before our eyes, so far away and yet so familiar. Their histories are certainly different and so are their circumstances. For one thing, they share the skin color of those who oppress them, but they are oppressed in the countries they call their own. They see their efforts to support their families coming to little or nothing, no matter what they do. And they have seen too many brutalized for making the smallest demands of those in power. They cry out for justice. And those cries are ones that many of us on a visceral level understand. In this country, Black History Month, which begins tomorrow, is once again upon us. At Tell Me More, we plan to observe it with a series of short essays by our colleagues at NPR and guests on this program, and we are asking them to tell us which figure from so-called black history they most adore and why. I already know we are going to hear some fascinating stories, some well known, many less well-known. My personal favorite is a woman I learned of only a few years ago. Her name is Harriet Jacobs and she was an enslaved American who hid in an attic for seven years to avoid being sold away from her children. She did eventually win her freedom, as well as her children's freedom. She went on to write a powerful account of all of this called Incidents in the Life of a Slave Girl. It was published in 1861 — four years before slavery was abolished by the 13th amendment. For a century, it was assumed that her story was a fictional account penned by a white abolitionist to win sympathy for the cause. But in a beautiful twist of fate, Harriet's story was authenticated as a true account by a woman named Jean Fagan Yellin, a white professor who herself took years to put it all together. Too often, we act as if history is something that lives in the calendar on the wall, or as artifacts stuck behind the glass in museums. But it is alive, happening around us all the time. February is as good a time as any to remind ourselves of this, as indeed, people across the ocean are reminding us of this right now.